The University of Minnesota was so pleased with the success of the the Women and Water Rights Poject in 2010 that they asked Liz Dodson to coordiate another Nash Gallery Exhibition. After a number on meetings with Ellen Schillase Liz invited Ellen to come on board and share the vision for the Women and Money project. 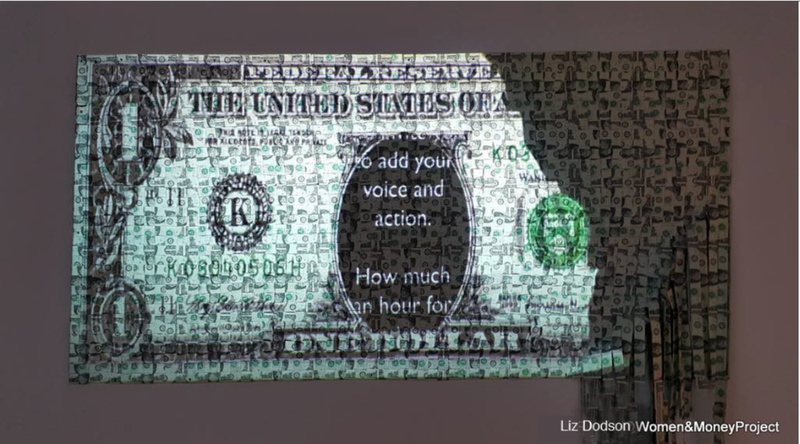 Liz Dodson and James Brenner collaboratipn for the Women and Money Project. 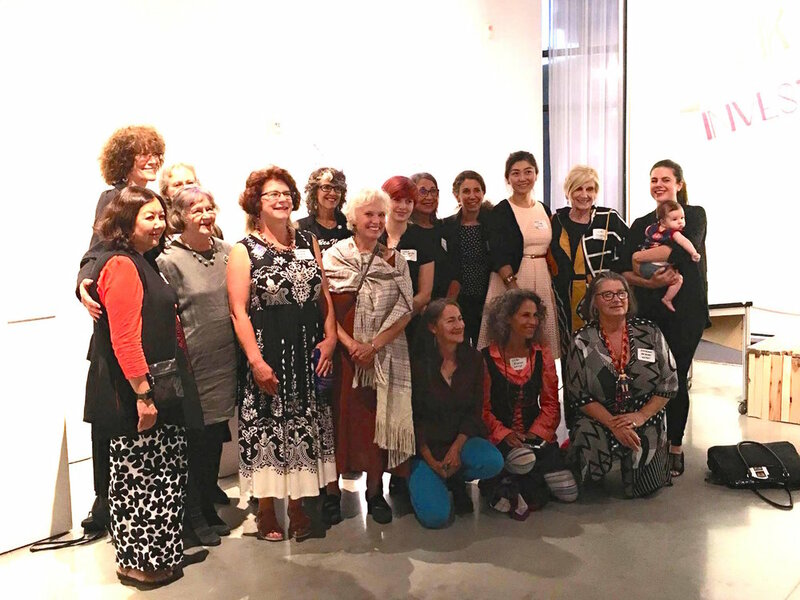 Some of the Women and Money Artists on the Opening Night. an except from the Beyond Boundaries catalog. 96" x 32" x 48"
The coming together of many things to make something different. In it’s most basic sense this simple yet challenging idea of many eco systems, many social polecat systems coming together to make a something different is the essence of what is necessary to effect change. How we view and interact with water is in need of change. It’s beauty and power to effect life are taken for granted. Our hope is that we may work together to effect change today in our immediate world that may collectively work together in a bigger sense to create a difference. "Liz Dodson was the impetus for the concept for "Water: A Universal Human Right." 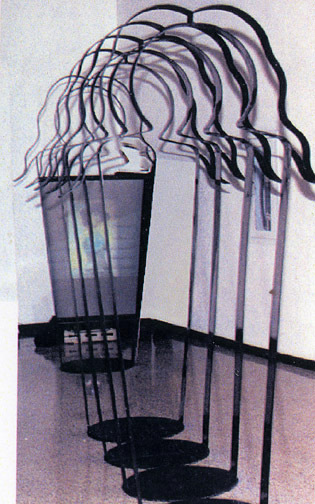 Liz, along with her son, James Brenner, presented a collaborative 3-dimensional installation at the Minneapolis exhibition. She was the Program Coordinator for the original Women and Water Rights at the esteemed University of Minnesota at the Minneapolis Katherine Nash Gallery and board member of the WCA Minneapolis Chapter. More information about the project can be found at : htttp//womenandrwater.net/about "
Since the early days of planning for the Women and Water and Rights, WWR Exhibition there was always in the planner's minds the idea that the exhibition would not end after the one 2010 WWR Nash Exhibition. Extending the life of the WWR Art Exhibition and bringing it's message to new audiences, is still our primary objective. The MN Women's Caucus for Art, MN Branch Women's International League for Peace and Freedom WILPF and the Department of Art, University of Minnesota, Twin Cities held the first travel exhibition Water Matters in Rochester, MN, had invited all of the WWR artists, 26 accepted, and many paid their shipping costs to be part of an eco-art exhibition. In November 2010, this exhibition and related program events opened at new Watershed Center Building. Liz Dodson and Marilyn Cuneo, WWR co-coordinators were opening speakers, and helped spread the WWR Exhibition Project message. Then Roslye Ultan, Curator of the Living Green Exhibition, Senior Faculty U of M put out a call to the artists of the WWR and invited them to participate in the May, 2011 Art as a Gateway for the Community Engagement: Sustaining Nature and Culture at the MN State Fair Grounds/ Fine Arts Building. The 10th anniversary for the LG Expo/Art Exhibition - the Living Green Expo is under the umbrella of the Mn Environmental Partners the event was on May 7th, and May 18th 2011. The MI WCA chapter organized the eco-art WWR Exhibition was at Finlandia University, Hancock, MI, Oct 27 - Nov 23, 2011, and then the Phillips Center for the Arts. June 15- July 22, 2012 WWR Hudson, WI. The project recognizes that we are at the threshold of a global water crisis and seeks to present the predicament and creative interventions. Women play a central role in water provision and management, women must be central in planning for the future. Today, women from all geographies, cultures, and traditions are grappling with the questions and challenges of what must be done to sustain water of the world, working from a variety of vantage points and perspectives. These expressions are a critical component to international dialogues about access to water and the need for creative solutions. The United Nations Assembly, in December 2003, proclaimed 2005-2015 the International Decade for Action, Water for Life to promote efforts to fulfill international commitments made on water and water related issues. This includes the Millennium Development Gaol to reduce by half the proportion of people without access to safe drinking water by 2015. The Women and Water Rights: Rivers of Regeneration project addresses the precarious state of the world's fresh water supply and the global need for gender mainstreaming in water management. Through an art exhibition and related programs, WWR underscores the messages that water access is a universal human right. used to describe an image on a computer or television screen that is made up of pixels, especially one that is unclear or distorted. Our proposition for this video/sculpture installation is to take that which is known in our everyday world “wa- ter” and record it, edit it, and spit it back out to the real world in the form of a video projection. But, the viewer will experience the virtual pixilated version of the water through a mechanical filter of another slow moving fluid: glass. This glass will be a wall of sculpted, fractured glass sandwiched between layers of steel which cre- ate yet another layer of filtration. The wall of sculpted glass will have a gentle wave movement in its form and will serve to mechanically pixelate the water imagery into a mysterious pattern of light that is familiar yet not clearly recognizable. The sound will set the tone and the patterns of light will create the atmosphere, to enable one to experience water in a different way. The pixilated water imagery of the virtual world will be transformed through a mechanical process thereby making it real, something we can touch in the real world. As collaborator, I , James Brenner, believe as a sculptor that there is a need for me to experience the world in a tangible physical way in order to fully understand it, in ways that do not necessarily speak to me through my intellect, but my being. The human being. And as the other collaborator, I , Liz Dodson as a video artist welcome a chance to stretch the possibilities of the video media with an interaction of another more concrete art form and then extend it into a surreal experience. The opportunity to collaborate with my mother Liz Dodson on a project which makes our worlds collide in a harmonious way, to intermix and come up with something new is a rare opportunity and one that I embrace on so many different levels. This is Petite's story, a woman who was sentenced for 18 months in prison. She was part of a polemic case that dealt with color, domestic abuse and injustice. A Place at the Table is a collaborative and diverse sculptural exhibition of "chairscapes" by female artists. The exhibit examines the beauty and variety of seating "at the table" and the symbolism of the places we sit - or are excluded from sitting in social, political and personal arenas. Wood, iron, bronze, copper, aluminum and video projection.